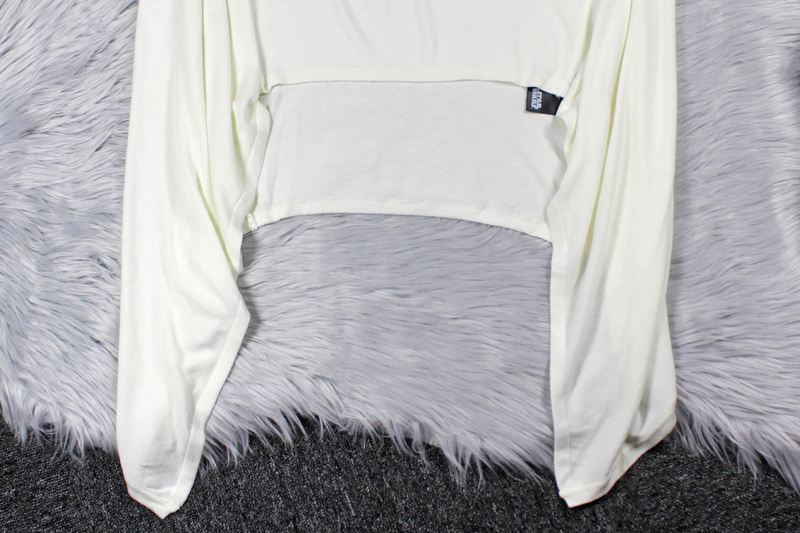 Today’s review features the Musterbrand x Star Wars Princess Leia sweater. 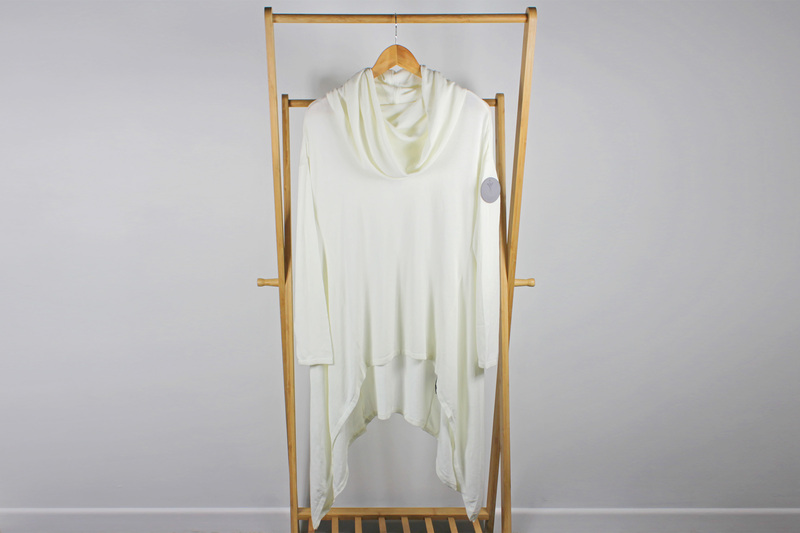 This gorgeous soft draped sweater is inspired by Princess Leia’s white dress from A New Hope, interpreted for stylish everyday wear. I instantly fell in love with this sweater the moment it was released – and it’s even better in person! Available in sizes XS to XXL (size S is currently out of stock), the sweater is priced at €129.00 each (approximately US$145.95 each) – Musterbrand and Shop Disney can ship internationally. 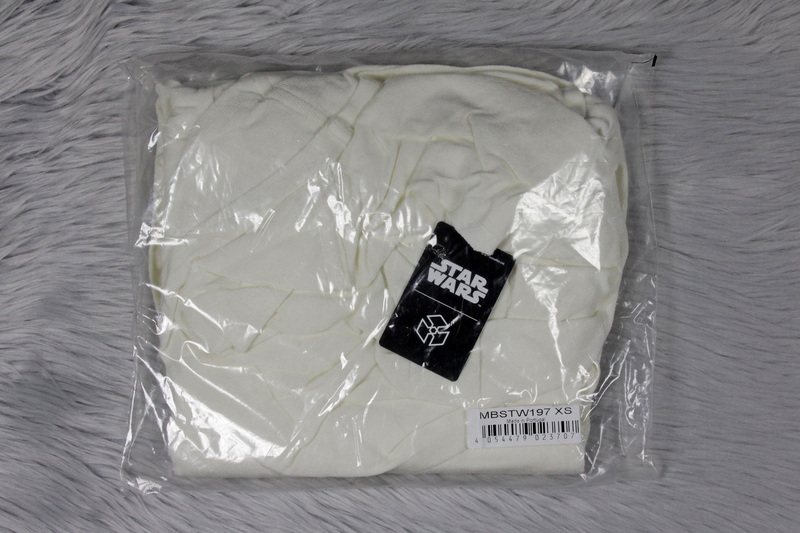 The sweater came packaged in a clear plastic bag, with a sticker marking the size, design style number, and bar code. As is often the case with knitwear, time spent folded up like this will result in creases when you receive the item – I used a garment steamer to remove the wrinkles, which worked very well (the garment tag notes you can also iron it). The Princess Leia sweater is made from an off-white knit material, and is inspired by Leia’s classic white dress from A New Hope. The sweater has a cowl/scarf-style collar, long sleeves with thumb holes, and a long draped high-low hemline. There is a small black fabric tag at the back of the neckline, which notes the country of manufacture (Portugal), and the garment size (XS). The cardboard store tag is attached to this fabric tag, with a back cord that loops through – I appreciate when tags do not pierce a garment, really there is no need to do that. The fabric of this sweater is so lovely and soft – I just keep thinking to myself ‘buttery soft’ when holding it. It is not a true stark white, it has a cream tone to it, which is a softer colour, and perhaps a little more flattering for a large draped sweater. 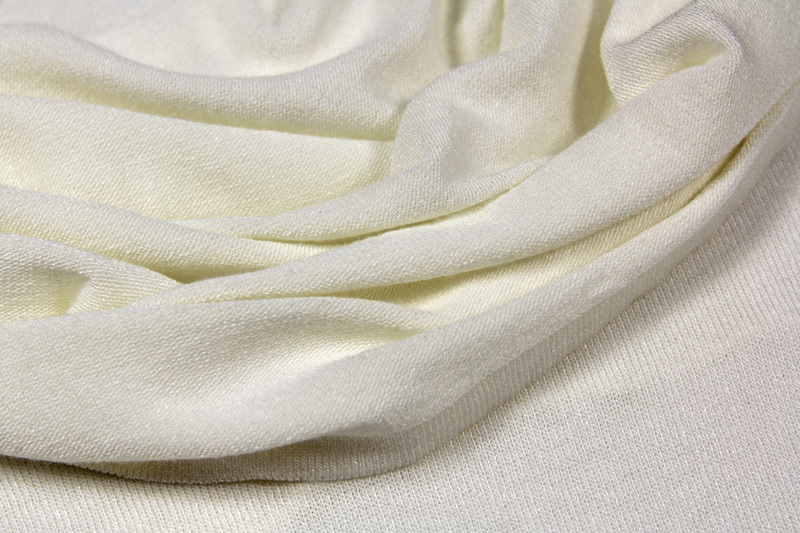 The knitted fabric is noted as 68% viscose / 29% polyacrylics / 3% elastane – it has stretch, and works very well for this flowy, draped design. The lightness of the knit gives a flowy feel to the sweater, not heavy – it doesn’t need to be cold weather to wear this, adding to its appeal. This sweater has so many lovely elements – I’ll start with the hood. One of the classic details of Princess Leia’s white dress is the large hood, which was large enough to cover her large hair buns. For this sweater, rather than a true hood, there is a large cowl-style collar. Seriously, this collar is gorgeous in its over sized scale! That’s not a draped sleeve, that’s the collar! It is not a ‘turtle neck’ like Leia’s dress collar – the base of this collar is quite wide, and widens along the length for a long bell shape. The back of the collar is slightly longer than the front. While this is not a traditional hood shape, it can be worn up around the head like a hood, but in a stylish draped way, not a hoodie. 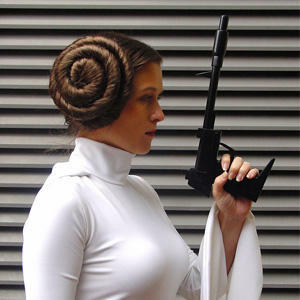 While brown hoods referencing Leia’s hair are fun, they create a sense of ‘dressing up as Leia’, rather than being inspired by her style. Keeping the collar the same colour as the rest of this sweater (rather than brown for ‘hair’) keeps the sweater from being too ‘costumey’ – that would clash with the style of the rest of the design. The collar has woven edges – that is, the edges are finished as part of the knit, not turned over and sewn like regular garments. This keeps the edges low profile and soft against the skin. 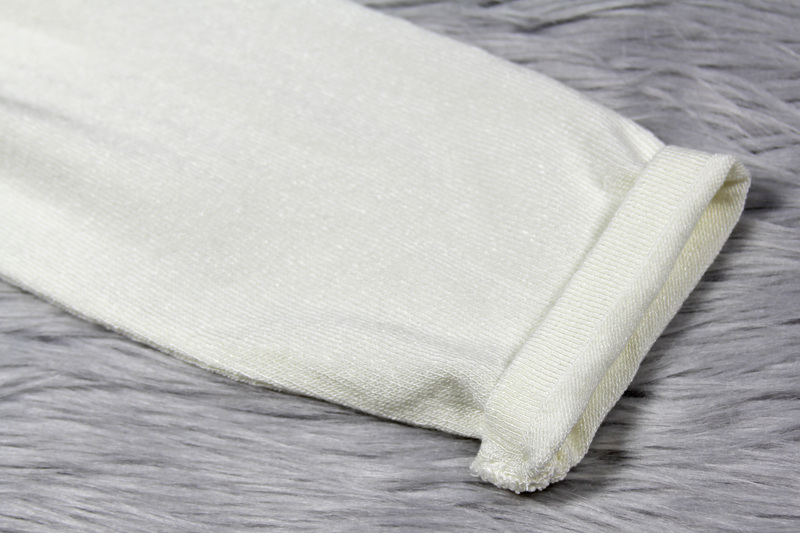 The hood is sewn from one piece, with a center back seam – this is covered with a binding strip, so the raw edges are secure and kept away from your skin. Rough edges always feel more prominent around your neck, so this keeps the collar comfortable to wear, and hides any ‘ugly’ seaming when you wear the collar rolled down in a cowl style. 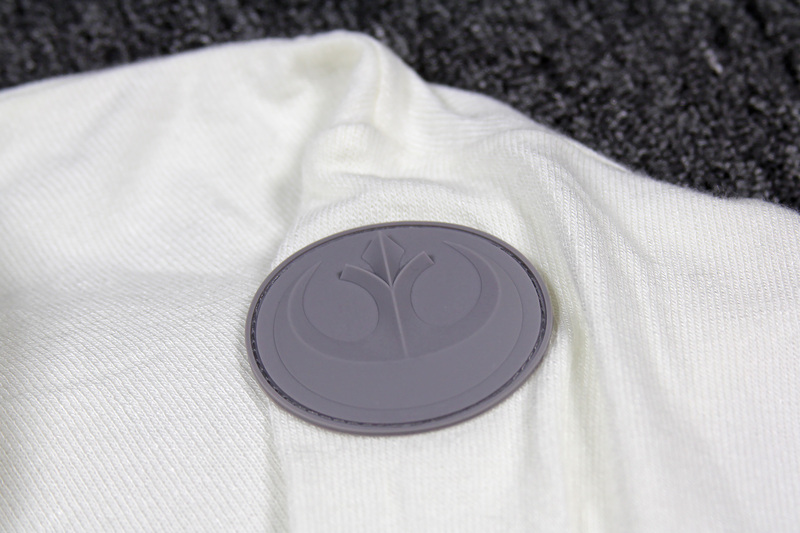 The left sleeve features a grey badge of the Rebel Alliance ‘starbird’ symbol. The grey colour works nicely with the pale sweater, drawing inspiration from the accessories Leia wears with her white outfits in A New Hope – silver plates on her belt, and later, silver jewelry and shoes during the Yavin medal ceremony. Whenever I think of Princess Leia’s white outfit, I always go for grey or silver accessories – so I happy to see Musterbrand chose grey too. The badge is made from silicone, with a raised design. The Rebel ‘starbird’ symbol is very crisp, even down to the fine points. The badge is sewn onto the sweater, stitched with colour matched grey thread, in a recessed rim around the edge. 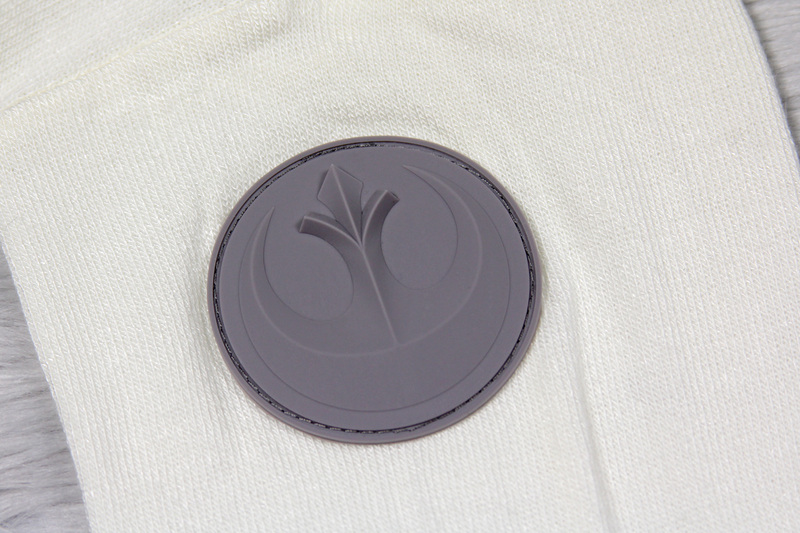 This is a design element Musterbrand has used before – their Rey sweater also features this badge, in a matching beige colour. This is the only outward Star Wars branding, so it keeps the design clean, stylish, and subtle. The sleeves are long and fitted – not wide and draped like the original Princess Leia white dress. White sleeves can get a little dirty, so keeping the hem closer to your hand will help avoid any accidents with long swinging sleeves. 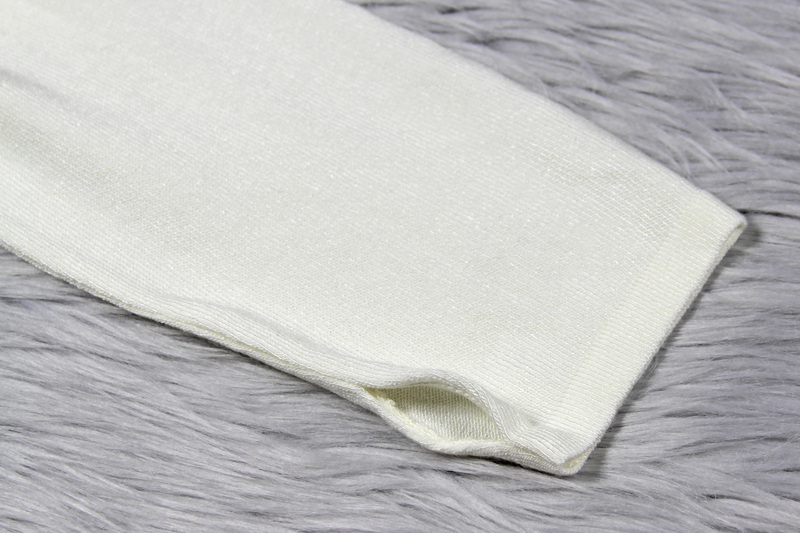 The end of each of the sleeves has a thumb hole, inserted in the side seam on the inner arm. The longer sleeves coordinate well with the long draped style of the sweater, creating the illusion of the original dress, rather than copying it. Like the hood, the ends of the sleeves are finished as part of the knit, not turned over and stitched. This keeps the sleeves nice and flat across the back of your hand – as these sleeves are design to be worn longer across the hand (with the thumb hole), rather than stopping at the wrist. The inside seam is overlocked (serged) to keep the raw edges tidy and secure. 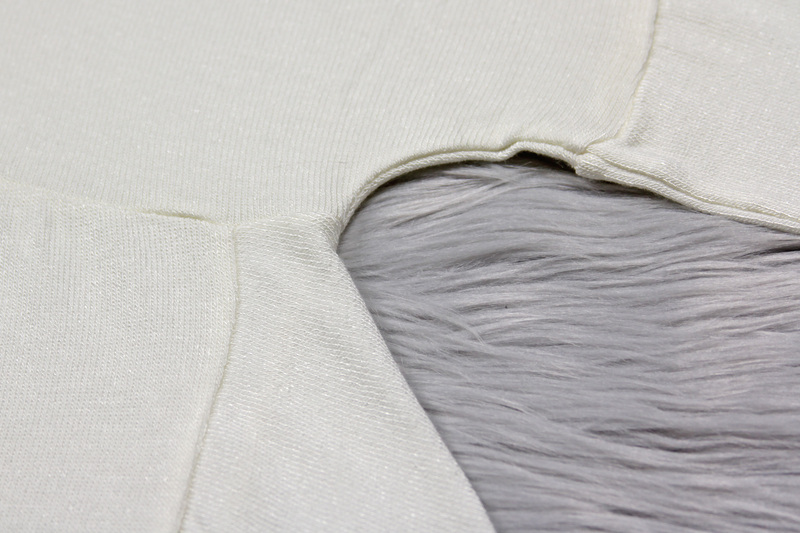 The seaming is all very tidy on this sweater – all the internal seams are overlocked (serged). The top edge seam of the sleeves is set just a little further down from the shoulder, which is expected with a ‘relaxed fit’ garment. Here we see the start of the side seams, with the high-low handkerchief hem. The back of the sweater is longer than the front – this gives the sweater a long draped look without being too much like a dress. The front lower hem ends around a usual sweater length around your hips, so you can wear this with pants or a skirt. The front and back lower hems are finished nicely with knit hems (not overlocked), so they hang very flat and not bulky. Rather than have the front and back panels extend out the sides, this sweater has a large insert panel at the sides to create the drape. I absolutely love this part of the design, the soft fabric works so well with the draped panels. Here you can see the side panel laid out flat – it is a large diamond shape, which starts under the sleeves and attached to the front and back panels at the sides. 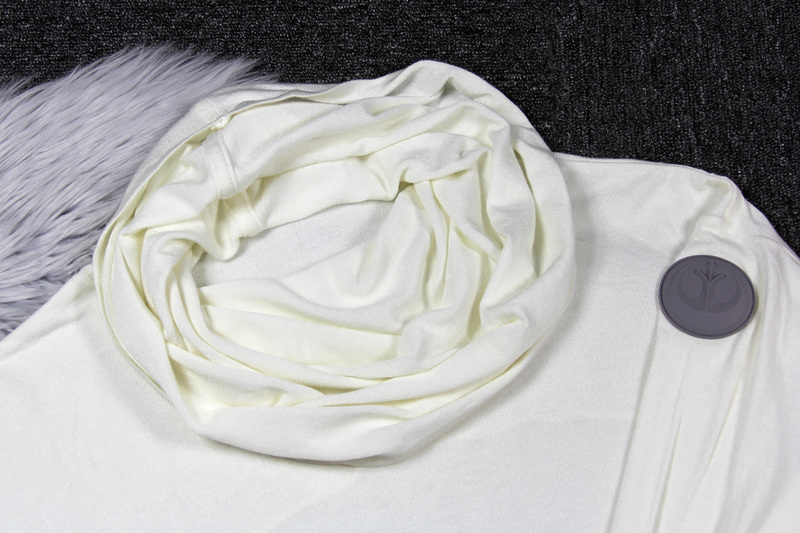 The diamond shape of course ends in a point, which creates the ‘handkerchief’ style hem. The front facing edge of the diamond panel has a finished knit edge, while the back facing edge also has a finished knit edge, but this has been second (after the front edges), so it is a little thicker. When hanging straight down, you can see just how much longer the sides are compared to the main body. Having long hanging hems at the sides is more practical for an everyday garment than having the whole garment longer. The long sides are another design element that references the original dress, but in a practical and stylish way. 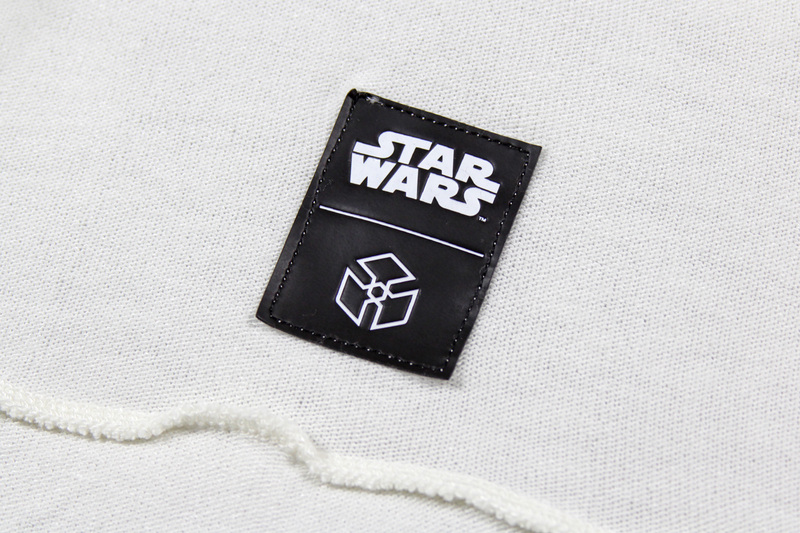 Sewn into the left lower inner side seam, there are three black fabric tags – the first features the Star Wars logo, the second features the Musterbrand logo, while the third features the fabric composition and garment care instructions. As mentioned earlier, the back of the sweater is longer than the front, so it covers your bum. This is great if you want to pair this sweater with leggings, but it also keeps the illusion of length without becoming a dress. Long in the places it can be, short in the places it needs to be – such a great balance between referencing the original dress, while still being very wearable for everyday style. 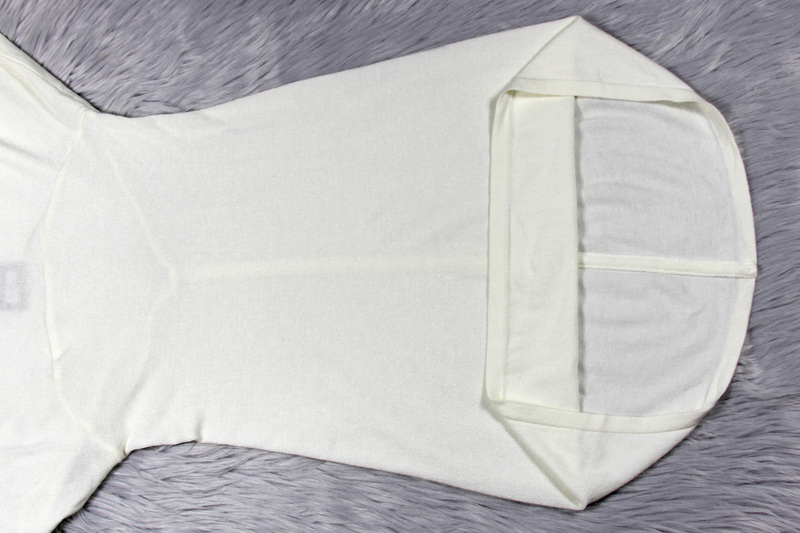 The back has a few more additional details compared to the front – the back has center seam, running horizontally across the back, just below the sleeves. The lower back panel has very subtle gathering across the top, to add a little more volume to the back. 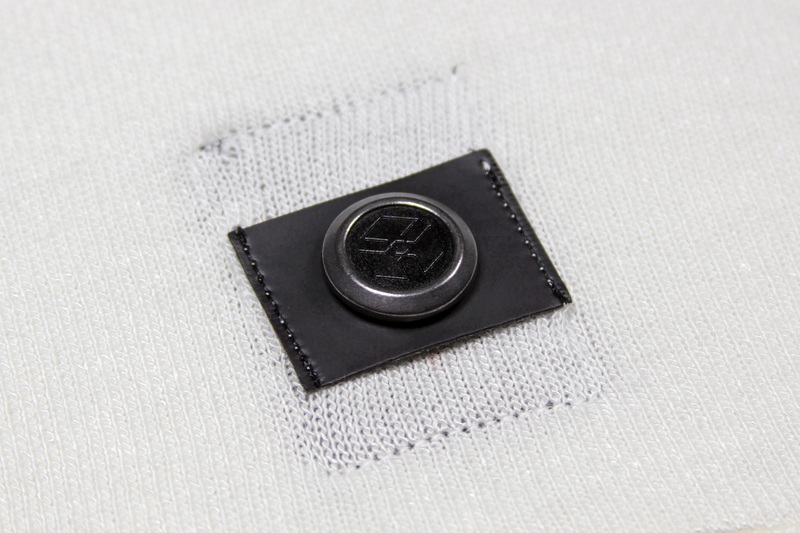 The back of the sweater features a small metal Musterbrand logo, set on a small rectangle of black faux leather. 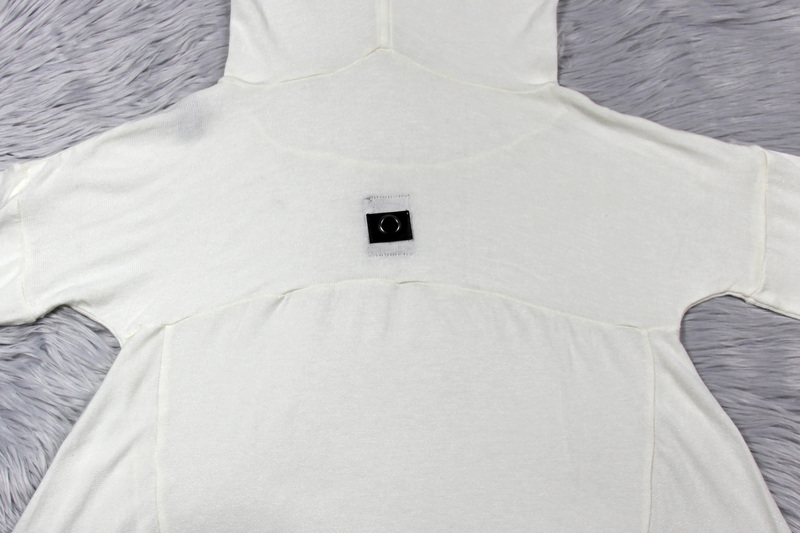 As you can see, this tag is sewn against something on the inside of the sweater – there is a ‘matching’ black faux leather tag sewn in the same place on the inside of the sweater. 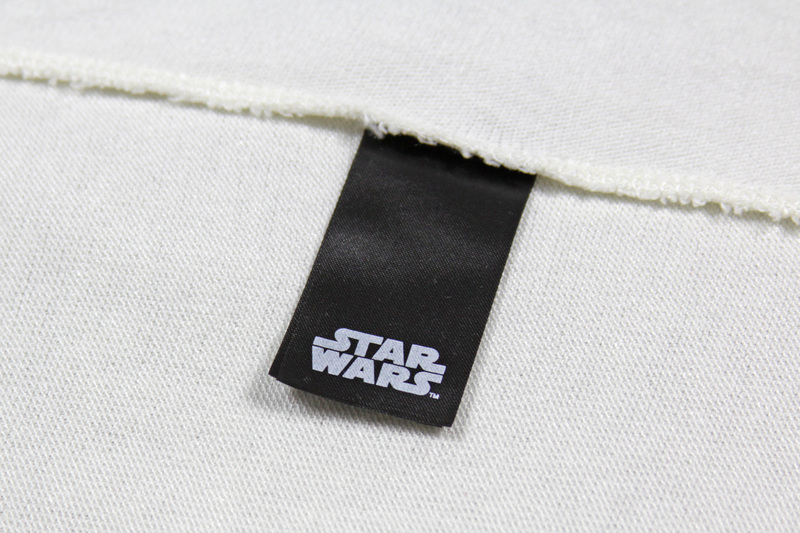 The inside tag is embossed with the Star Wars logo and Musterbrand logo. While this tag is black, as you can see in the photo above, it only just shows through to the outside, and forms a base for the Musterbrand metal logo. Each tag provides a sturdy base for the other, so they don’t ‘hang’ on the soft fabric. This is such a beautiful interpretation of Princess Leia’s classic dress – perfect for fans who don’t always want to be too literal with a white dress, but still keeping the original theme. 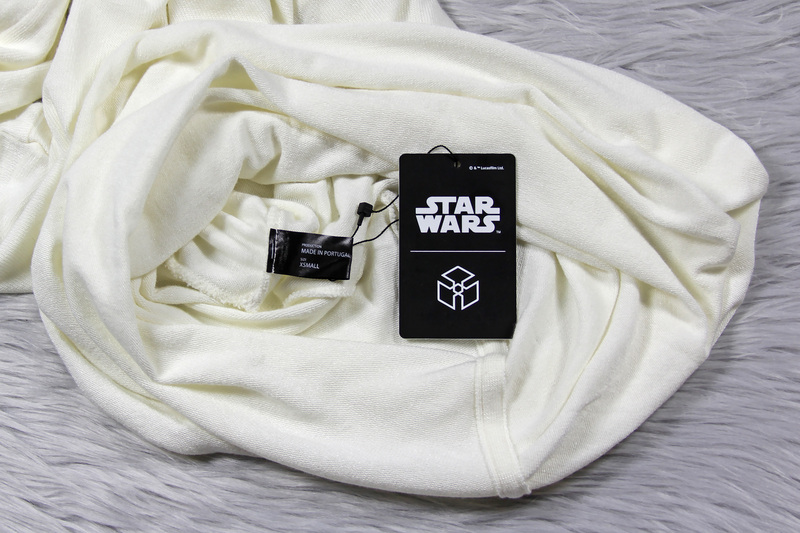 The sweater has all the attention to detail I expect from a Musterbrand garment – the perfect blend of Star Wars inspiration and everyday style. I can wear this anywhere without feeling dressed up in costume, but with the perfect balance of Leia inspired elements to still be a Star Wars garment. Disclaimer: this item was supplied by Musterbrand for review purposes. The Kessel Runway stands by the position that this, and all of our reviews, are an honest analysis and opinion regardless of whether the merchandise was purchased or supplied by a manufacturer/retailer.